His music gives you the clubbing feels and the EDM thrills. Australian record producer Emoh Instead, now the lone force behind the Electronic music project What So Not, has dropped the announcement regarding his tour, and has closed-in on Saturday 11th May 2019 for a stint at the Fillmore Auditorium. The moment he drops the beats, there is no shortage of excitement as What So Not is fully loaded with pulsating rhythms and heart-pounding beats that will keep you moving like there's no tomorrow. Lock-in your tickets to do the show if you don't want to find yourself dancing home alone. Give your gang a shout out so nobody is left behind. The best thing about this is you don't have to drag yourself to a ticket booth. With a few easy clicks starting with 'buy tickets', no need to leave your seat…you'll be well on your way to dance the night away! What So Not started out as a duo. Mainly due to 'creative differences', Australian record producer Emoh Instead (stage name by Christopher John Emerson) took up the cudgels and is now the lone force behind the powerhouse EDM music movement called What So Not. Yet Emoh is quick to explain that What So Not is not closing any doors to collaborative endeavors. "We are developing so many different concepts with amazing artists, musicians, visual techs, collaborators, and we've gotten something together that is really cool. Sort of the new/old What So Not and a taste of what I hope to bring to this in the future." 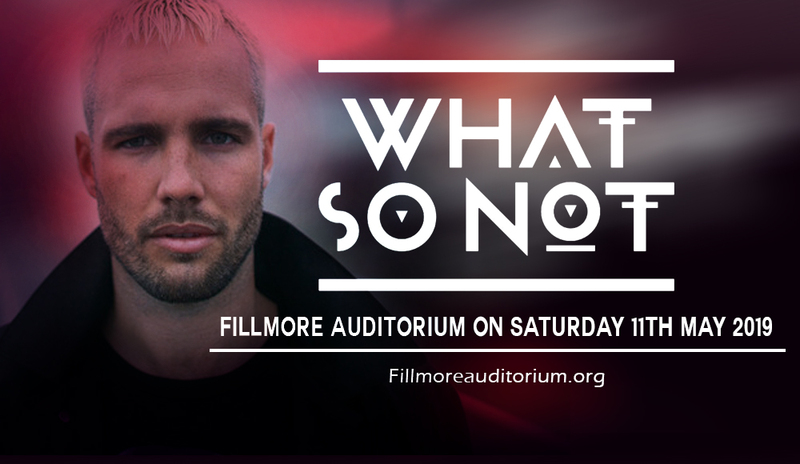 What So Not is a staple in music festivals and tours all over the world. He has played in various festivals, including Coachella Valley Music and Arts Festival, Pukkelpop, Ultra Music Festival and Lollapalooza. He has a trail of amazing hits which include "Gemini" (featuring George Maple), "Jaguar", "High You Are", "Tell Me" (with RL Grime) — just to name a few of the ammunition of hits he'll be shooting non-stop as soon as he hits the stage. What So Not is in the business of inducing electrifying every inch of you that will make you just wanna get up and dance! It's impossible to resist this, so go get your tickets now!